This is an approximately real-color image from the Hubble Space Telescope, of galaxy cluster Abell 3827. The galaxy cluster is made of hundreds of yellowish galaxies. At its core, four giant galaxies are smashing into each other. As the topmost of the four galaxies fell in, it left its dark matter trailing behind. 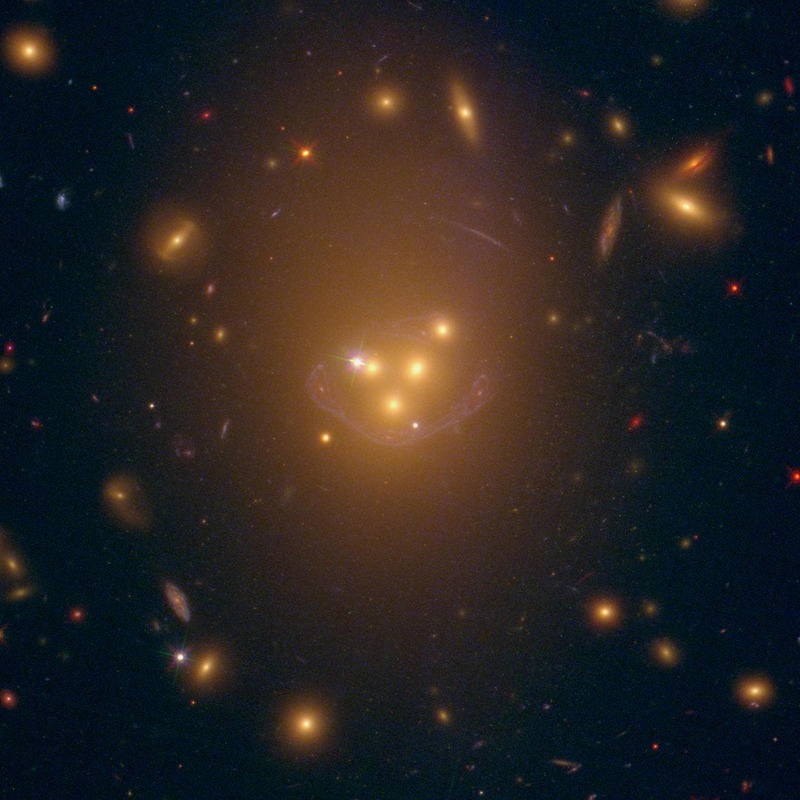 The dark matter is invisible in this image, but its position is revealed by tell-tale gravitational lensing of an unrelated spiral galaxy behind the cluster, whose distorted image is seen as a blue arc. Trailing dark matter is predicted by theories in which dark matter is not perfectly dark, but feels more of the fundamental forces than just gravity. Writing in the journal Monthly Notices of the Royal Astronomical Society today (Wednesday, April 15, 2015), the researchers said one dark matter clump appeared to be lagging behind the galaxy it surrounds. They said the clump was currently offset from its galaxy by 5,000 light years (50,000 million million km) – a distance it would take NASA's Voyager spacecraft 90 million years to travel. Such an offset is predicted during collisions if dark matter interacts, even very slightly, with forces other than gravity. Computer simulations show that the extra friction from the collision would make the dark matter slow down, and eventually lag behind. Scientists believe that all galaxies exist inside clumps of dark matter – called "dark" because it is thought to interact only with gravity, therefore making it invisible. Nobody knows what dark matter is, but it is believed to make up about 85 per cent of the Universe's mass. Without the constraining effect of its extra gravity, galaxies like our Milky Way would fling themselves apart as they spin. In the latest study, the researchers were able to "see" the dark matter clump because of the distorting effect its mass has on the light from background galaxies – a technique called gravitational lensing. The researchers added that their finding potentially rules out the standard theory of Cold Dark Matter, where dark matter interacts only with gravity. "We used to think that dark matter sits around, minding its own business," said Richard Massey, Royal Society Research Fellow, in Durham University's Institute for Computational Cosmology. "But if it slowed down during this collision, this could be the first dynamical evidence that dark matter notices the world around it. "Dark matter may not be completely 'dark' after all." The researchers note that while they appear to have observed the offsetting of dark matter, more investigation will be needed into other potential effects that could also produce a lag between the dark matter and the galaxy it hosts. Similar observations of more galaxies and computer simulations of galaxy collisions are under way to confirm the interpretation. "Our observation suggests that dark matter might be able to interact with more forces than just gravity," said Team member Professor Liliya Williams, of the University of Minnesota. "The parallel Universe going on around us has just got interesting. The dark sector could contain rich physics and potentially complex behaviour." Last month (March 2015), Dr Massey and colleagues published observations showing that dark matter interacted very little during 72 collisions between galaxy clusters (each containing up to 1,000 galaxies). Today's latest research concerns the motion of individual galaxies. Researchers say that the collision between these galaxies could have lasted longer than the collisions observed in the previous study – allowing even a small frictional force to build up over time. The main uncertainty in the result is the timespan for the collision: the friction that slowed the dark matter could have been a very weak force over acting over about a billion years, or a relatively stronger force acting for "only" 100 million years. Taken together, the two results bracket the behaviour of dark matter for the first time. Dark matter interacts more than this, but less than that. Dr Massey added: "We are finally homing in dark matter from above and below – squeezing our knowledge from two directions. "Dark matter, we're coming for you."